Nalanda university ruins are located in Bihar State of India from 90 KM far of Patna city near Bihar Sharif town. Nalanda university is a UNESCO World Heritage Site and the official name is an Archaeological Site of Nalanda Mahavihara. These ruins are belonging to the ancient university of Nalanda. This ancient university falls under Nalanda District. Nalanda is an ancient university which was established in 5th century CE. The area of ruins is spreads in 240 metre in width and 490 metre in length. Nalanda university ruins covered an area of around 30 acres. Archaeological Survey of India did the first survey of the site in 1861-62. The first excavation of Nalanda universities was carried out from 1915 to 1937 and second excavation was done from 1974 to 1982. Six major temples and Eleven monasteries were also excavated. The Nalanda archaeological museum is located across the road opposite to the ruins of Nalanda. It remains open every day and Nalanda ruins timings depend on the season you visit. Nalanda university ruins opening time is 9 in the morning. The Nalanda ruins closing time is 5 in the evening from March to September. From October to February closing time is till 4.40 PM. There is no weekly off for this site. Nalanda Archaeological Museum timings are 9 AM to 5 PM and weekly off is Friday. Counter closing time is 4.45 PM. The Nalanda ruins ticket cost is affordable to the Indian national as compared to foreigners. Indians need to purchase a ticket of 15 as an entrance fee. SAARC Nations and BIMSTEC country residents need to purchase the ticket of 15 Rs. Foreigners need to pay the entry fee of 200 Rs. Children up to 15 years of age are eligible for free entry. Photography and Videography are allowed inside the premises of Nalanda university. Video camera charges are 25 Rs. Official guide prices start from 200 Rs and it depends on visitor’s group size. A guided tour will take around 2 to 3 hours to complete the whole trip. Nalanda Museum Ticket prices are very affordable and it is operated by Archaeological Survey of India. 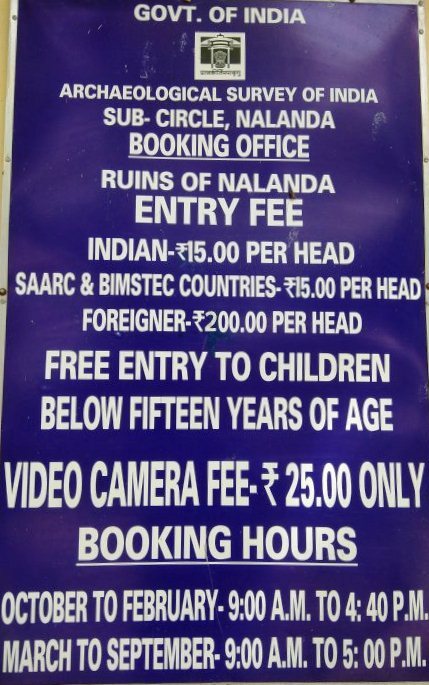 Entry fee of Nalanda Museum is just 5 Rs and entry is completely free for children till 15 years of Age. Ticket counter closes at 4.45 PM, therefore, last entry time to Nalanda Museum is 4.45 PM. Nalanda is located around 90 KM from the Patna, capital of Bihar. Nalanda is a small town and it is only connected by only road. Nearest Airport is Patna airport, which is 90 KM from here. Rajgir railway station is the nearest railway station to Nalanda, however, it is not well connected. Gaya and Patna railway stations are more convenient and appropriate railway stations. Both stations are 90 KM far from here and good connectivity from the rest of the country. Rajgir is the nearby town from the Nalanda which offers good hotels and it is just 12 KM from here. Rest of the journey can be covered via road only. Only horse tonga and cycle rickshaw are the only mode of local transport in Nalanda city. Bihar is a very hot state and temperature can shoot up to 45 degrees Celsius during summer season. At least two hours are required to cover this site, therefore winter season from Mid October to March or any cloudy is the best time to visit this UNESCO World Heritage Site. If you are planning to visit this site in summer season, morning time is preferable to visit Nalanda Mahavihara. Nalanda Museum offers free first AID, cold drinking water, wheel chair and toilet facility to their visitors. 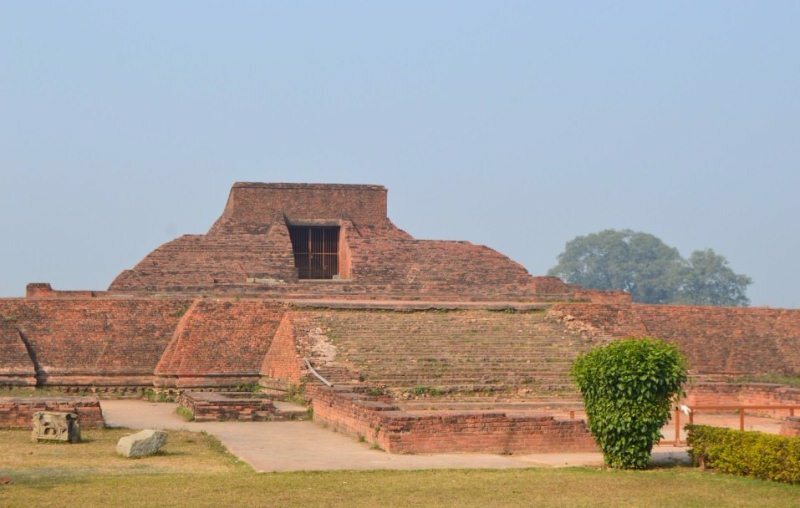 Nalanda university ruins are must visit archaeological sites for history lovers, explorers and who have a keen interest in heritage sites and archaeology. If you are planning to stay in Patna or going to Patna, then should visit Patna Zoo, Mahavir Temple and Buddha Smriti Park near the railway station. Eco Park, Patna Planetarium are also should be visited during Patna trip.